The Parque del Lago Hotel is a hospitable and comfortable hotel located at the entrance to town, close to banks, museums, shopping center and the Metropolitan La Sabana Park. 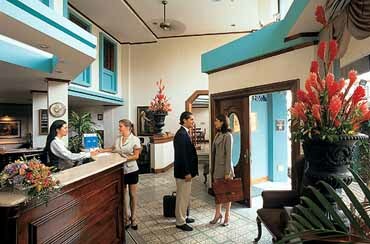 The hotel has an atmosphere of elegance, traditions and quality - decorated with fine woods, hand made mosaics and features of the architecture of San Jose at the turn of the century. Located only 15 minutes from the Juan Santamaria Airport and close to the 18-hole golf course "Valle del Sol". 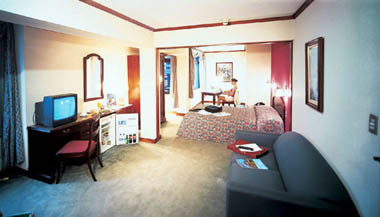 The hotel is open year round and the warm climate of San Jose is present all year also. The Parque del Lago Hotel is a perfect accommodation for visitors traveling for relaxation and pleasure and the business person seeking convenience of location and conference room capabilities. The Parque del Lago Hotel has 40 luxury rooms located in a single building of 4 stories equipped with an elevator. The accommodations include standard rooms with double beds, suites and a penthouse. Available amenities include: direct dial phone, internet data port, cable TV, safe, full bathroom, air conditioning, coffee maker, smoke detector, sound proof windows, carpeting, hair dryer, mini-bar and non-smoking accommodations. Other services offered: business center, private parking, medical services, laundry, message service, bellboys, jewelry boutique, room service, airport shuttle, fax and modem. For the business person requiring arrangements for a conference or meeting - the Parque del Lago Hotel has 4 private conference rooms equipped to accommodate up to 50 attendees, with audio-visual equipment, VCR, TV, Slide Projectors and video beam. 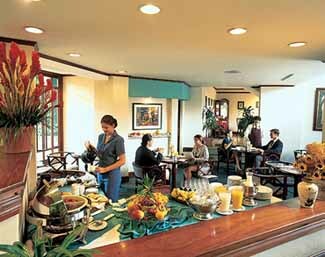 The Hotel Parque del Lago offers on-site dining at the "Calalu" Restaurant or the lobby bar cafeteria. The guests are also invited to enjoy the facilities at the Barcelo San Jose Palacio Spa and Casino. The Parque del Lago is maintained in the same impeccable style as all Barcelo Hotels, Resorts and Casinos. Shopping for Costa Rican craftsmanship is a varied experience. A wide variety of goods which reflect the country's typical traditions and features, ranging from replicas of pre-columbian objects or the traditional Costa Rican cart up to the modern, elegant designs. Wood and clay sculptures, pottery, leather goods, jewelry and wickerwork are also to be found. Articles can be bought in the center of San Jose. The Parque del Lago Hotel is conveniently located to the international airport and close to the center of the city. The weather averages at 85 degrees F. Whether your visit to Costa Rica may be for pleasure, relaxation or business... a Barcelo Hotel and/or Resort is ready to accommodate you.